Ahead of talks between the Hong Kong government and student protestors scheduled to take place on Tuesday evening, Hong Kong Chief Executive CY Leung attempted to defend his handling of the protests – but may have simply emboldened the protestors further. 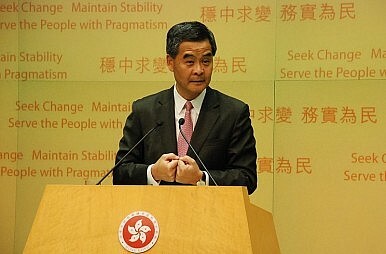 On Monday evening, Leung spoke to reporters in the Government House, his official residence. In his remarks, he defended the use of a broadly representative nominating committee to select candidates for the position of chief executive, as required by the National People’s Congress Standing Committee’s decision. Detractors, including the protestors, argue that this set-up would allow Beijing to handpick all candidates for the chief executive. Beijing, meanwhile, has argued that it has every right to require Hong Kong’s top leader to be supportive of the mainland government, as Hong Kong is a part of China and not an independent country. Leung, however, took an entirely different position in defending the NPCSC decision, and in doing so touched on the economic issues that are also at play in the current protests. As the New York Times reported, Leung said that complete universal suffrage (the model the protestors are seeking) would risk turning Hong Kong into a welfare state as poor people gain more influence in politics. If the election is “entirely a numbers game,” Leung said, “then obviously you would be talking to half of the people in Hong Kong who earn less than $1,800 a month.” Instead, Leung interpreted the words “broadly representative” to mean equal representation for all sectors in Hong Kong – regardless of the actual population that makes up each category. The idea that the chief executive should not be overly concerned with the political views of Hong Kong’s poor, no matter how many of them there are, is sure to strike a chord with protestors. Many of the current protestors (as the Wall Street Journal points out) are already upset about deteriorating economic opportunities. Hong Kong has one of the developed world’s largest wealth gaps, making it difficult for many families to make ends meet in a city famous for its high cost of living (particularly the high cost of real estate). Meanwhile, this anger at economic pressures spills over into broader anger at Hong Kong’s political system. To many protestors, Hong Kong’s current government, Beijing, and big business are effectively in cahoots – and none of them care much about the average Hongkonger. Making things worse, many Hongkongers blame an influx of mainland Chinese for their own difficulties finding jobs and buying real estate. Given the role economic tensions have played in the protests thus far, Leung’s remarks play right into the protestors’ hands. He has now effectively gone on record saying that it is the chief executive’s main job to create and maintain a favorable environment for businesses, and nothing (not even popular opinion) should be allowed to interfere with this task. Leung said that he was sensitive to the concerns of many of Hong Kong’s less fortunate, but argued that faster overall economic growth was the answer, rather than programs designed to provide increased welfare. Essentially, Leung is adhering to Beijing’s time-honored message that fast economic growth will cure all ills. Ironically, Beijing itself is increasingly acknowledging that this policy has run its course, and now emphasizes environmental protection and social equality (particularly addressing the rural-urban divide) rather than the old model of economic growth at all costs. Leung’s remarks emphasize how far apart the government and protestors are, in terms of philosophy as well as on the issue of concrete demands. Leung went beyond defending the nominating committee to attack the idea of universal suffrage itself. He clearly feels that democracy is dangerously close to mob rule, and thus a major threat to Hong Kong’s economic future. Meanwhile, the protestors believe that Hong Kong’s identity is in jeopardy due to Beijing’s overbearing influence, and that democracy will provide a much-needed check to ensure Hong Kong’s leaders are accountable to Hongkongers. To Leung, democracy is a problem; to the protestors, it is the solution. With such an immense conceptual gap, it’s hard to imagine tomorrow’s talks providing any closure to the current crisis.